My first encounter with these beautiful crystals was in 1992 when I visited a mineral dealer, Marco Scherier, from Renningen during my studies in Stuttgart. It was a play of luck that just few days earlier he had received a fresh lot of amethyst from Mexico. The shelves in his shop were loaded with colorful specimens in a quality that could not be compared to anything that I had seen before. I was stunned by the electric purple color and the breathtaking luster of the amethyst crystals perched on a matrix of fine crystalline green epidote. A color combination that can only be made in dreams. 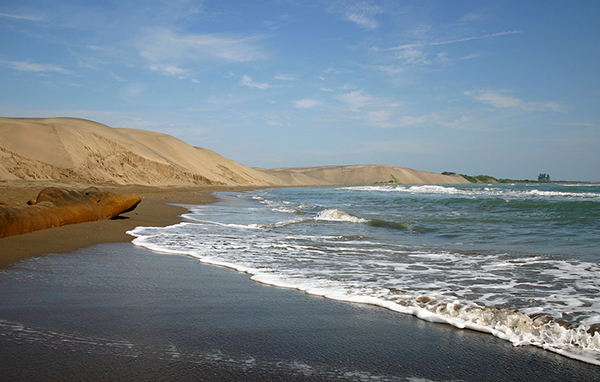 Marco said that their locality was near Las Vigas, a small town in the Veracruz state of Mexico. With one gorgeous specimen in hand I left the shop imagining what an experience it must be to see these crystals in the pockets where they are found. Searching through the available literature I was excited to find a full‐color article by German mineral collectors Lieber and Frenzel published in Lapis magazine in 1990. 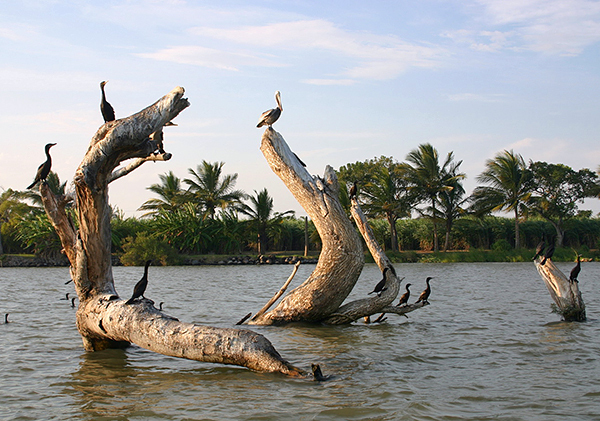 After reading this article full of beautiful and inspiring photographs I was determined that I will visit this place. 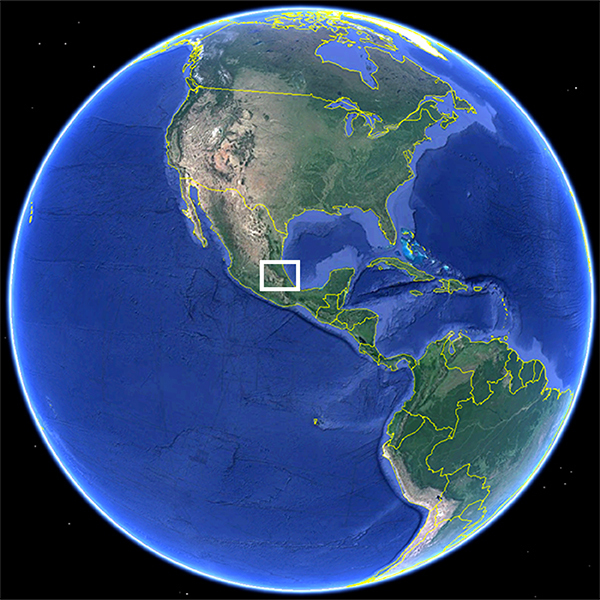 Area of our trip on the map of Central America. 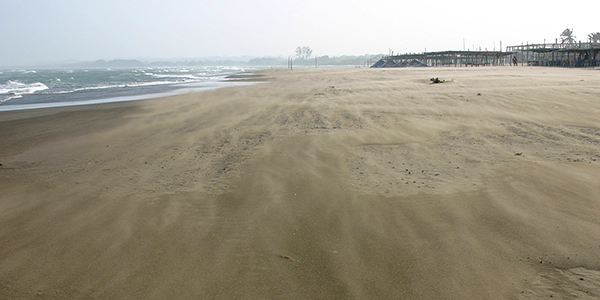 The area between Mexico (City) and Veracruz at the Atlantic coast. The amethyst local­ity is located in the State of Veracruz in the mountainous area near the town Las Vigas, not far from the capital city Xalapa. 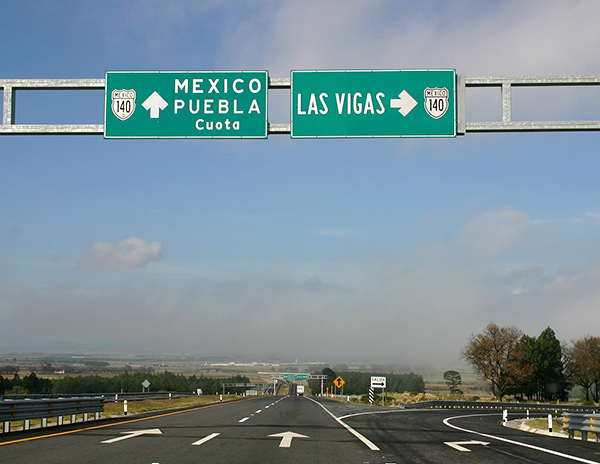 Las Vigas is accessible in a few hours drive by the inter­ state motorway from Mexico. It took few years before all things matched up for the visit. At the Munich mineral show in 2014 I met a mineral dealer, Mark Kielbaso, from Tucson who was familiar with the situation around the amethyst locality. He gave us some precious hints on how to get around in Las Vigas and we were set for the visit. The main objective of the expedition was to visit the collecting sites, possibly at the time when some amethyst pockets are opened; an ambitious plan, but worth a try. While I was responsible for the interviews and photography, Miran was in charge of purchasing best specimens that were for sale. For those, who like to avoid the high temperatures, late autumn may be good time for the visit. In Mexico (City* the Mexicans call their capital city just Mehiko, so first time we were completely baffled when somebody said that he must go to Mexico; aren`t we already there?!) we rented a small Chevrolet and hit the payable motorway (autopista) to the east in direction of Puebla and then Xalapa (Halapa). Soon after Mexico the motorway crosses a mountain range at 3200 m above the sea level; and your car feels that. 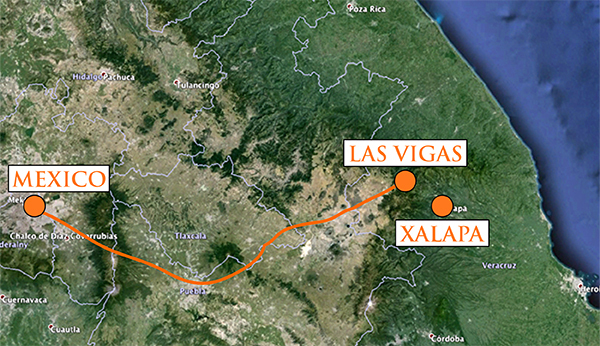 Well maintained payable motorway from Mexico to Xalapa with not much traffic. 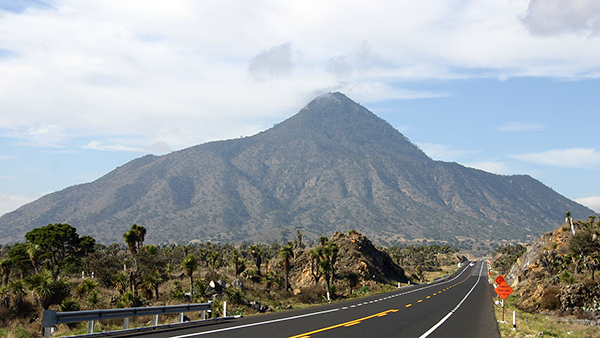 Scenic view of subtropical vegetation along the motorway between Puebla and Perote. After 4 hours drive through the scenic landscape we reached the old colonial town of Las Vigas de Ramirez – the origin of the famous Mexican amethysts. Along the main street, which passes through a central square with a church and a monument to the scholar Rafael Ramirez, there are numerous small shops with groceries, clothes and many selling shoes. The latter enchanted Miran who was checking out for some shoes for most of our free time. At the main square Miran asked a taxi driver, if he knew of any amethyst dealers here in Las Vigas. He nodded in affirmation, screened around, and reluctantly pointed to a young guy, Beto, who was just rushing down the street. On the way to Las Vigas. 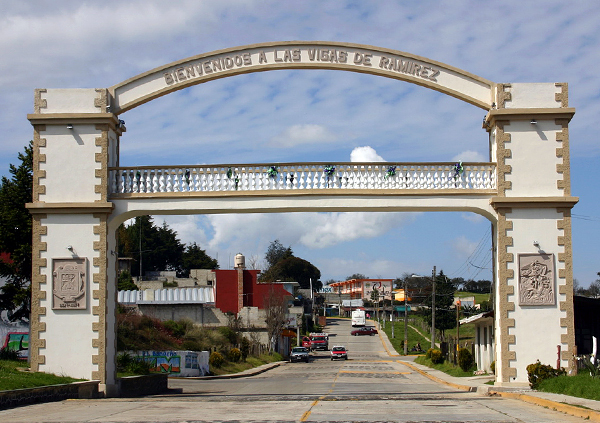 The main gate to the town of Las Vigas, when entering from east side. 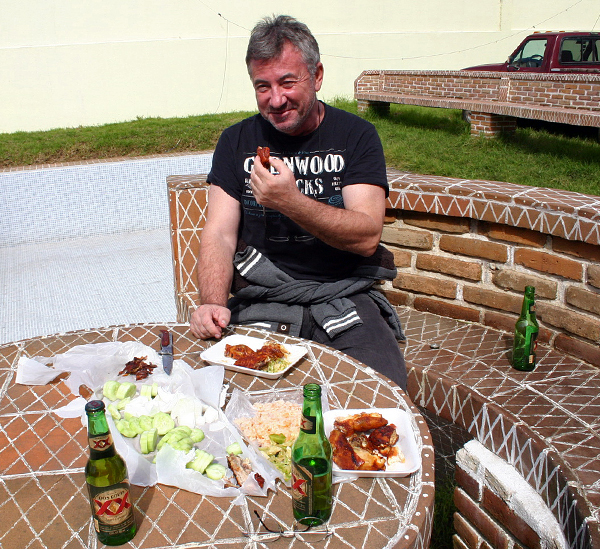 Beto took us to his friend who was living in a house in downtown in Las Vigas. We went to a terrace and he brought a huge plastic basket and started to lay out amethyst specimens. The owner said that he is selling the whole lot for 50.000$ (pesos, not US$; 100 US$ = 1.270 $) and high grading is not allowed. This is the rule of the local mineral dealers. 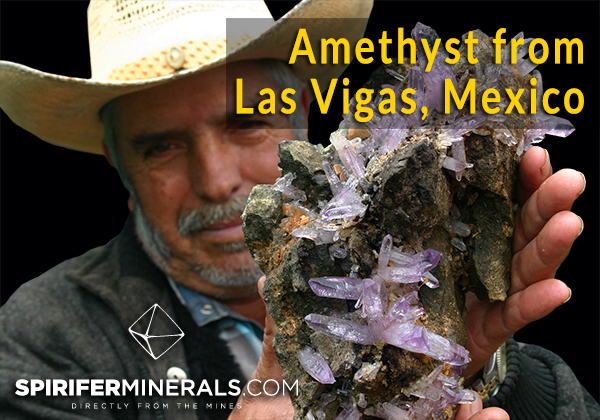 They purchase complete lots from amethyst miners. By selling only the best specimens from a lot they would soon be left with unattractive specimens of poor quality that nobody wants, and they would soon have a problem of how to get rid of them. So you must buy a lot, which commonly contains 100 specimens or more, depending on the size of the pocket. We heard stories of best lots being sold at 300.000$. Las Vigas de Ramirez, the town renowned for beautiful amethyst crystals, lies at an ele­vation of 2450 m. The main street down to the main square from west. 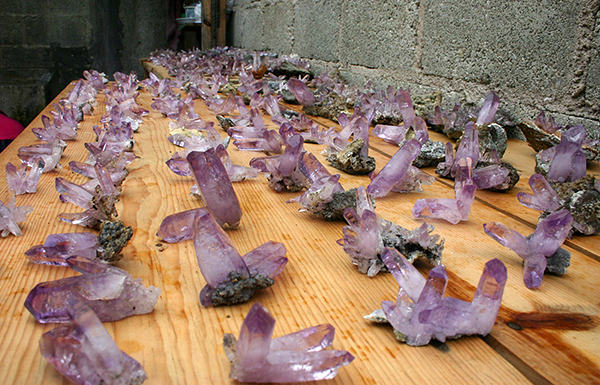 First lot of amethyst specimens on a terrace of a mineral dealer in Las Vigas. We enjoyed inspecting the first amethyst specimens at the legendary site! There were mostly matrix specimens, few crystal floaters, many of them scepters. Their color was pale so we were not too happy with this offer. Miran asked if there are any better specimens to see, and Beto offered that we could go to his house where he has a smaller lot, but it was not too good either. He had specimens from different localities: a dozen amethyst specimens with intense purple color, artichoke‐like sceptered large crystals with milky interior, ordinary pale purple crystals and tiny purple amethysts on white matrix. In addition to amethyst he also showed us a batch of andradites from La Concordia; A variety of specimens that gave us a hint of what may be found. Well displayed specimen with intense purple amethyst crystals perched on brown calcite and white zeolites from the locality Torrecellas near the village Piedra Parada. 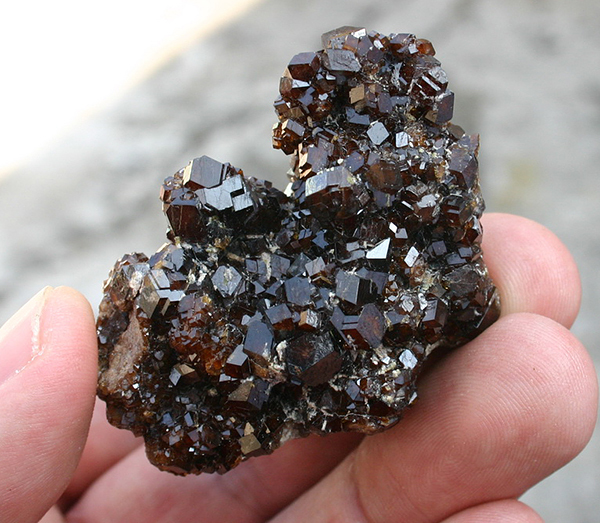 Andradite specimen from skarn zone at the contact of andesite and marble. Most dealers say that they originate from La Concordia across the valley north of Piedra Parada. As this was not a typical lot, I asked Beto where we could get more of the intense purple amethysts and the scepters that he showed. He told us that they are from dona Dolce Maria of Tlacolulan, a small town east from Las Vigas. He was happy to join us. The traffic on the local roads is heavy and slow although they are well maintained. In addition, the Mexicans have some fetish to sharp speed bumps that tear your wheels away if you are not careful. To cross one you must practically stop and slowly climb over, first with the front, then with back wheels. The thought of driving fast is out of question, and realizing that cools you down to a slower pace. For the distance of 20 km we needed almost one hour. Doña Maria showed us two rooms full of amethyst crystals. Four big tables each with 150‐300 specimens from different finds. Dona Dolce Maria and her son in front of her house in Tlacolulan. 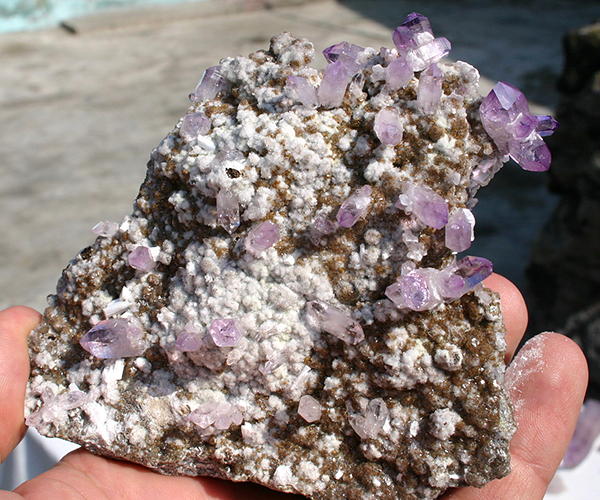 A group of intense purple amethyst crystals on matrix from Piedra Parada. Skeletal amethyst scepters on andesite matrix. Most of the crystals show fluid inclusions. Intergrowth of doubly terminated intense purple amethyst scepters. 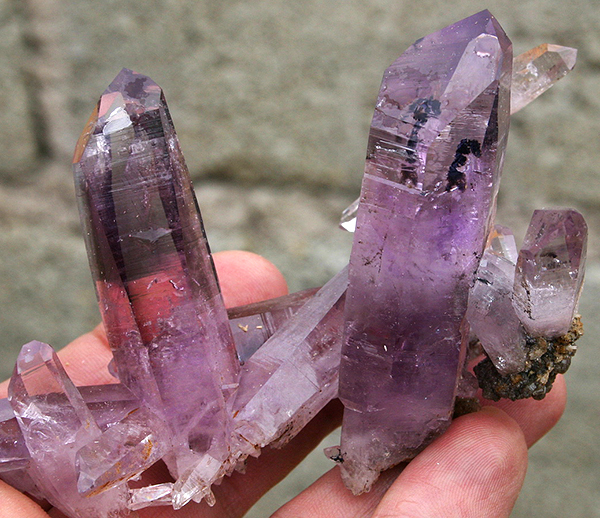 A dream­piece cluster of amethyst scepters. Three scepters intergrown at their base. Note the interesting growth from the smaller to the larger primary crystal. In the scepter phase the same amount of material was depos­ited on all three crystal points. The larger crystal displays an onset of skeletal growth. At the time of our visit a miner from Piedra Parada visited dona Maria and offered a small lot of transparent and lustrous scepters of unusual smoky color and rare purple tips. Most of the crystals were skeletal with fluid inclusions. They were reminiscent of the Poretta skeletal quartzes. Dona Maria was not interested in the material because they were of poor color. I liked the fast move of Miran who without hesitation purchased the small lot of 30 crystals. We need diversity and these crystals were exactly what we will need for completion of our Las Vigas collections. Happy with our first acquisition we returned to Las Vigas. 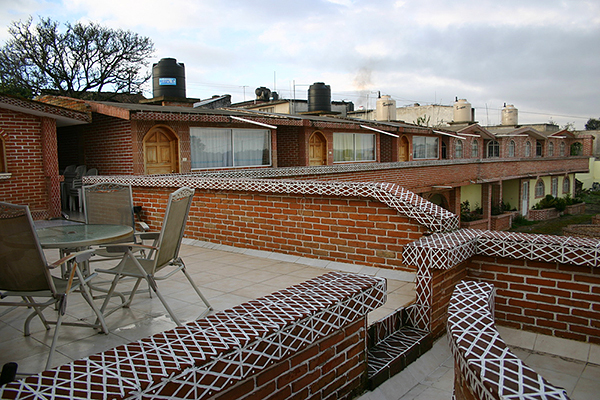 We stayed in the only hotel in Las Vigas with an Aztec‐like architecture. First we intended to commute to a nearby city of Xalapa but the thought of staying close to the amethysts was comforting and we decided to stay. There were not many visitors and we could choose any room we wanted at the cost of 500$ per day. With the climate at this time of the year the rooms were very humid and cold. We did not think of this until the evening when we had to crawl into wet and cold beds with all of our clothes on. The rooms had no heating, only hot water that was much appreciated in the morning. We woke up early, at dawn, with the call of roosters. There was no breakfast at the hotel, so we went out to find a restaurant. There are not many in Las Vigas. By chance we stopped at a place called El Artesano, owned by a very kind shaman lady. Hotel in Las Vigas where we stayed. Shaman drawing of animals and amethyst crystals in restaurant El Artesano, Las Vigas. She told us that for the best amethyst (piedras) we must go north of Las Vigas, to the village of Piedra Parada where the miners are living. 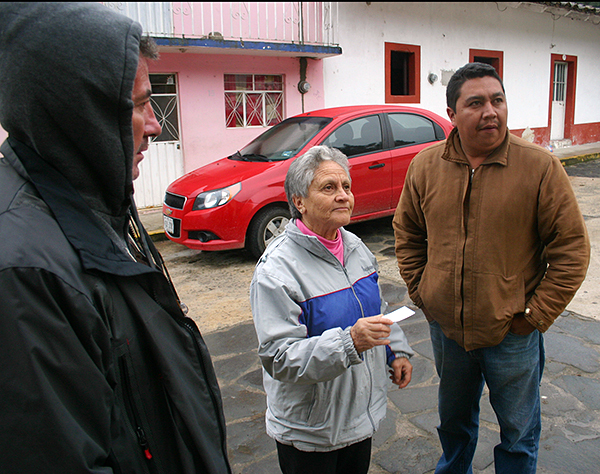 Her mason, Julio, joined us to help us make contacts with the local miners. 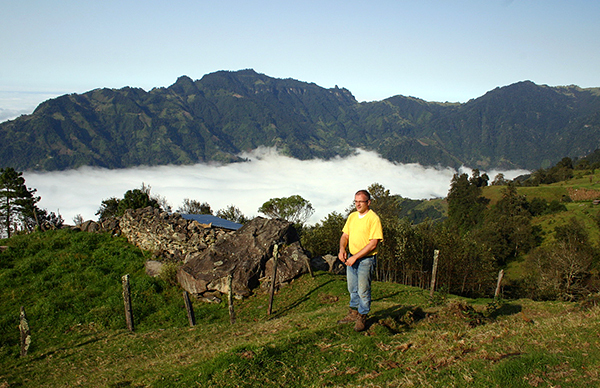 The village is located 15 km north‐east of Las Vigas, in the municipality of Tatatila. A small part of the road is paved and most of it is a gravel road perfectly drivable by regular car, even if loaded with four men. We were finally going to the source of the crystals! 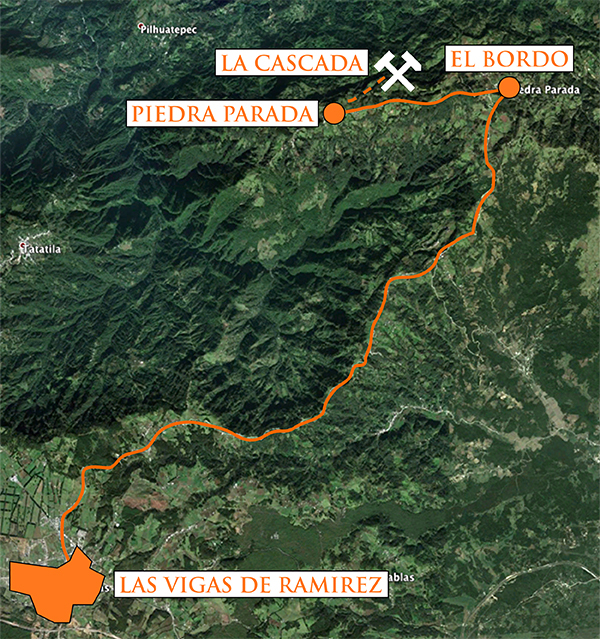 A map of the area between Las Vigas and Piedra Parada (the name means – a standing rock) and amethyst locality (La Cascada). 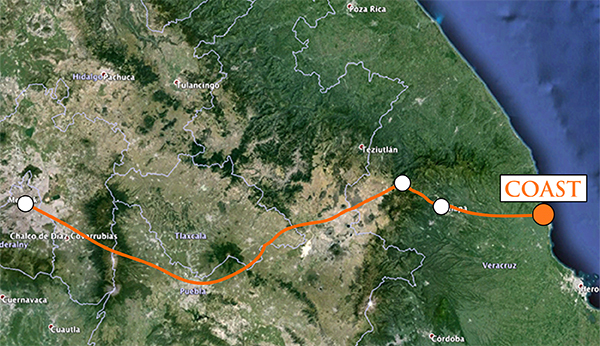 The Google map shows a wrong position of the village; it is located 3 km west of the Piedra Parada mark. The marked village is called El Bordo. 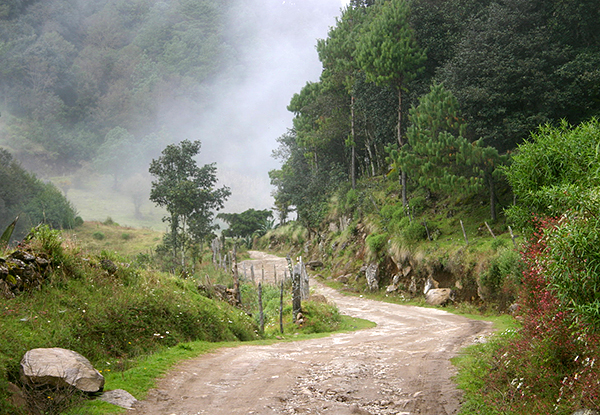 A view along the gravel road to Piedra Parada, short after the turn from El Bordo. The village has around 2000 inhabitants and a school for 300 children. They have few small private groceries and a church. 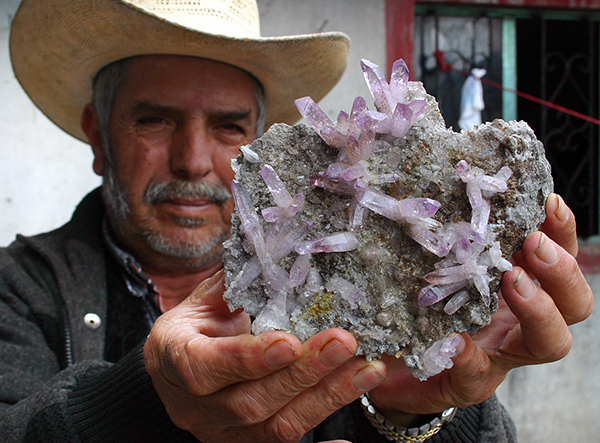 Most of the people there are farmers living from agriculture and cattle, but some 80 families make their livings as miners of amethyst crystals on the northern slopes of Piedra Parada. We stopped at the church where Julio looked for Raul Ortega, the most productive amethyst miner who recently found one of the best amethyst pockets. He was busy somewhere else and the children that surrounded us suggested that we should visit Jose Ortega, an older miner and an amethyst dealer. Jose was home and he had 3 lots of amethysts on offer. 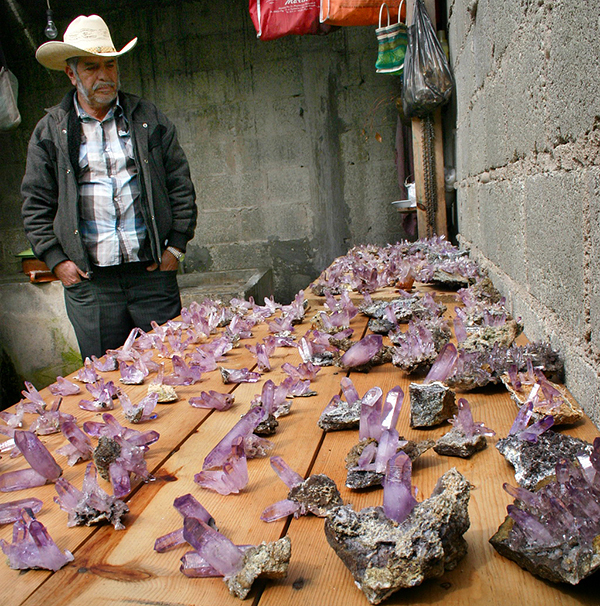 Jose Trujillo Ortega presenting a matrix specimen perched with amethyst crystals. One of the three lots was truly exceptional. It contained high quality specimens with no junk pieces and all of them of a good color. The average size of the crystals was between 5‐7 cm, they were long prismatic and mostly floaters. Jose offered a truly fair price for what was on the table. So there was not much to think about. The lot was ours. We had to drink tequila and were offered with gorgeous baked tortillas with different salsas. Now that we have purchased a lot, things became more interesting. The man saw that we are serious and he offered us to come next week to his son in law who lives in Las Vigas. There he said he has even better specimens, but for a higher price. This is what we came for! A lot of excellent ametyst specimens from El Bordo, 3 km east of Piedra Parada. The crys­ tals had a superb electric purple color and most of the specimens were complete floaters with no visible point of attachment. The average size of the crystals was 5­-7 cm. 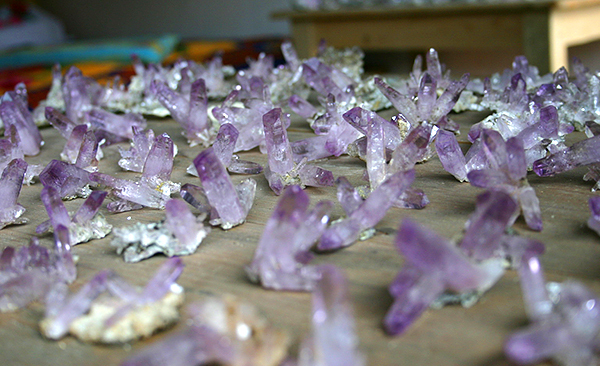 A close­up of the amethyst lot. Jose`s daughter with her children came to see us after the purchase of the lot. 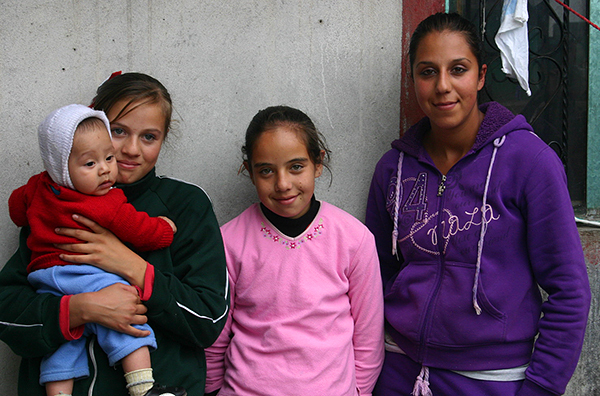 Many of the local kids are blue­eyed and blonde ancestors of the old French settlers of the village. The natives in this area are otherwise of the Aztec origin. For the few days in between we made plans for visiting the collecting sites. 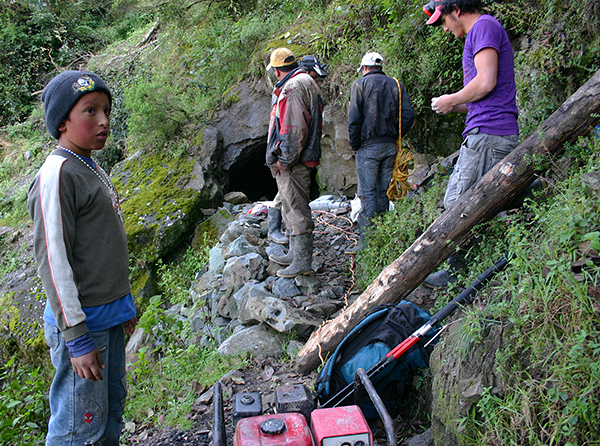 The field trip was organized by a young local miner, Sergio, from Piedra Parada. We parked the car at the beginning of the village from where we had only a 45 minute long hike to the legendary locality La Cascada with a beautiful waterfall. The mountainous area appears much like the one back home, with simple agriculture and numerous meadows with sheep and cows. Here people live with the land and survive on what they produce. Their respect to the land can be seen in tidiness of every small part of it; there is no waste around and the forests are taken good care of. 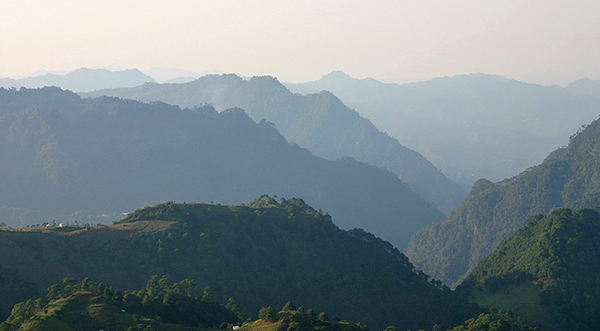 A view of Sierra Madre mountains to the north from Piedra Parada. 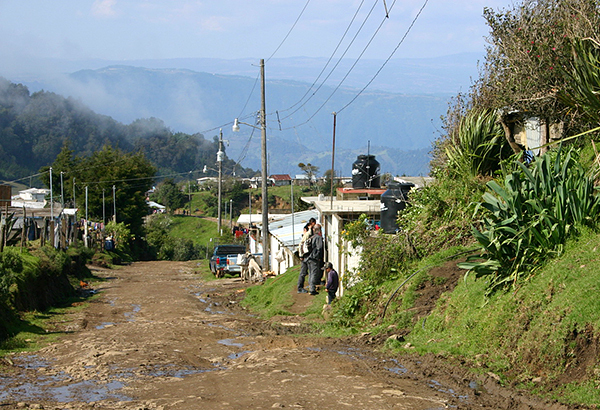 A road through Piedra Parada, the village close to the famous amethyst localities. Typical landscape with meadows and wire fences to prevent cattle from escaping down to the valley. In the background is La Concordia ridge, known for andradite finds. 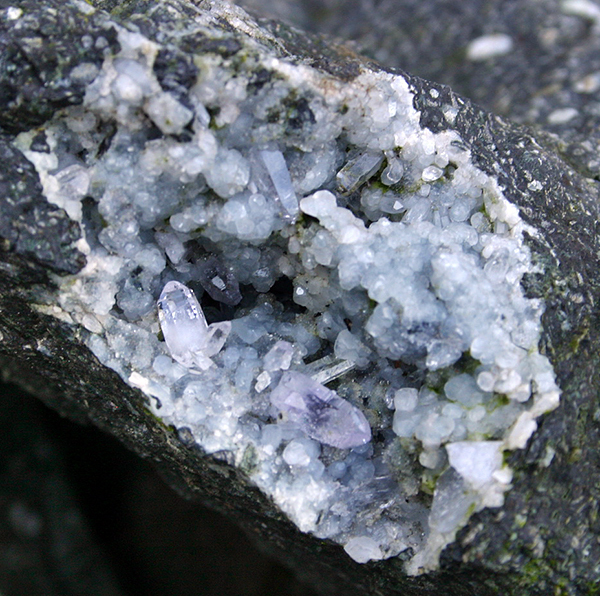 The amethyst localities are found down the plateau in outcropping andesite cliffs. After a descent for some 300 meters down the north slopes of Piedra Parada we reached the locality La Cascada with a legendary 50 m high waterfall over the open cliff of andesite. It is surprising that the localities producing splendid specimens for more than 80 years still had no au‐ thentic documentation of the collecting sites, except some general area photos in Lapis (1990) and Mineralogical Record (2003) articles. The first sight of the amethyst workings high in the andesite wall is breathtaking. These are not simple alpine pockets as described in the old articles, but actual mines in compact host rock. Picks, crowbars and hammers appear completely useless and only then I realized why the locals were mocking when they saw my precious titanium strahlstock – wondering in bewilderment what the heck I want to show with this?! The rock is massive, no quartz veins, fissures or clefts that would help tracing the crystal pockets. 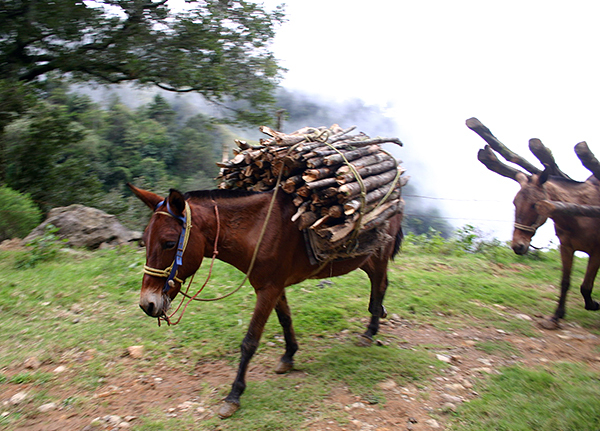 On the way to the La Cascada, a famous locality for deep­ purple amethysts on andesite matrix. 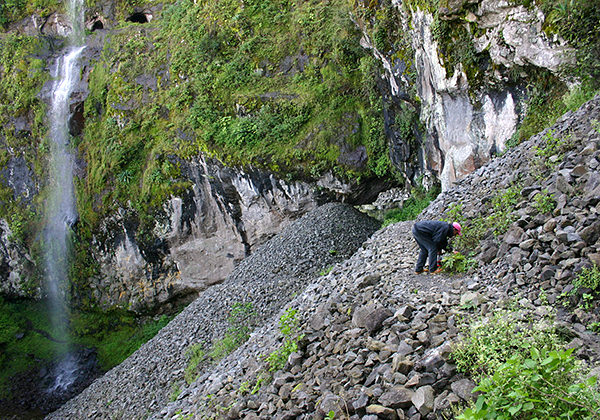 A huge dump of excavated andesite under the amethyst mines at La Cascada locality. 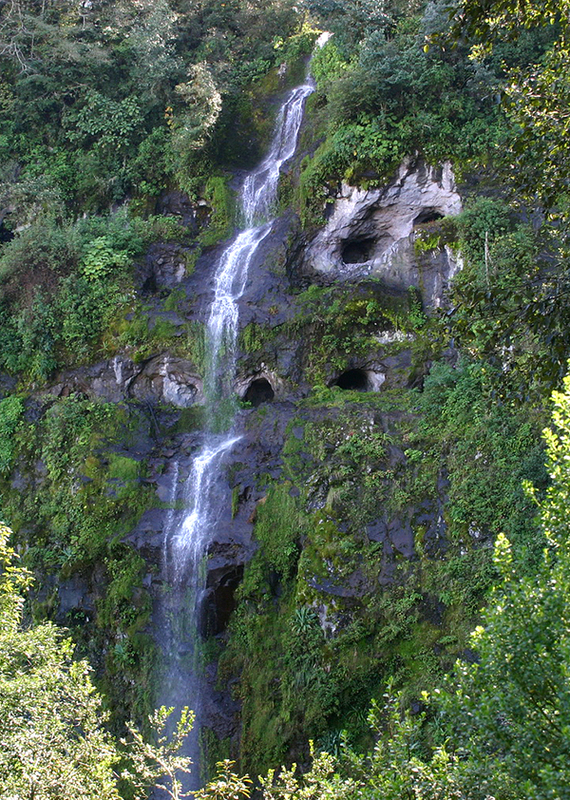 La Cascada, a famous locality for deep ­purple amethysts on andesite matrix. 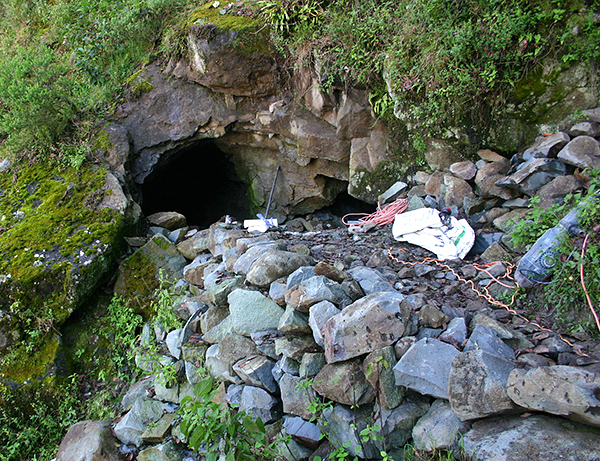 The mines are excavated along three amethyst producing levels, 3­5 meters apart. The whole amethyst zone spans over 10­15 meters in vertical direction. The adits are con­nected by horizontal trenches chiseled out on the face of the exposed andesite wall. 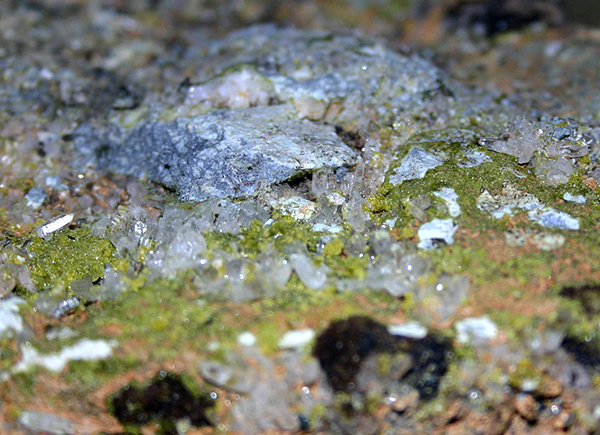 The amethyst crystals occur in vesicular andesite that formed by exsolution and rapid expansion of volatile components during extrusion of magma. Such vesicles (cavities) are more common for basaltic magmas (zeolites), but they rarely occur in andesitic magmas, like here at Piedra Parada. 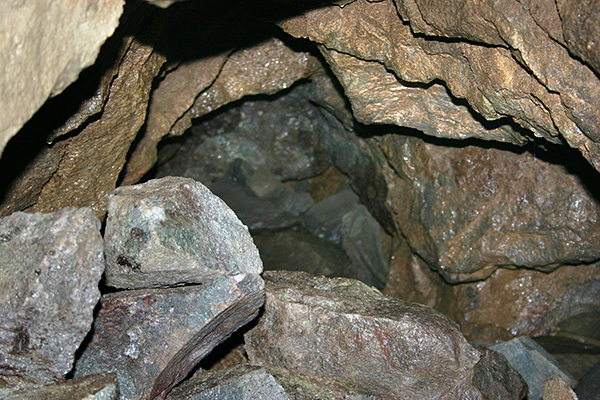 The cavities are commonly filled with minerals that crystallize on cooling of entrapped fluids. The most common are chlorite, chalcedony, followed by crystallization of quartz (amethyst), lepidocrocite that can be found as inclusions in amethyst or hydrated in the form of limonite covering the crystals, epidote, barite, calcite and a variety of unidentified zeolites. 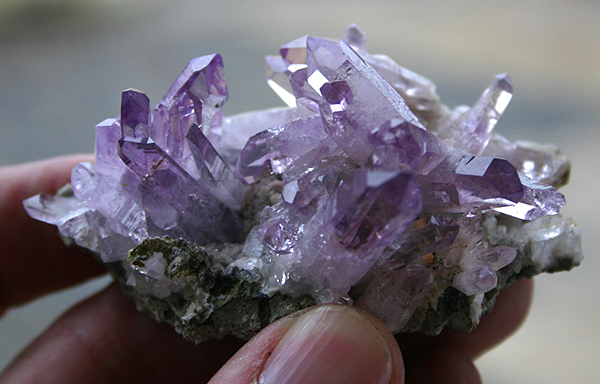 In the upper levels of the amethyst‐bearing zone the cavities are smaller, reaching only up to 5 cm in diameter, while in the lowermost levels the cavities reach enormous dimensions and contain the best amethyst specimens. 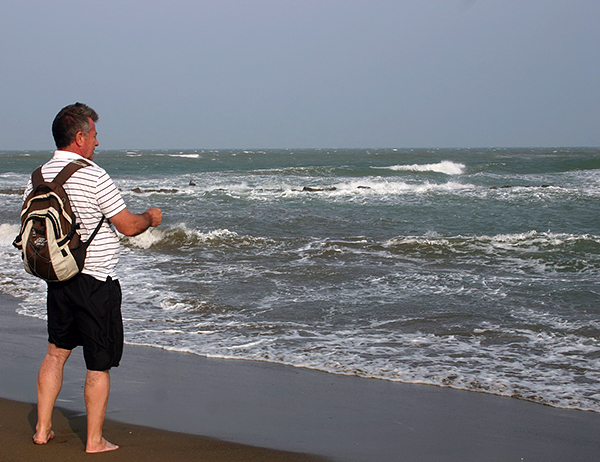 The largest pockets reached lengths of over 3 meters and widths of 1‐2 meters. 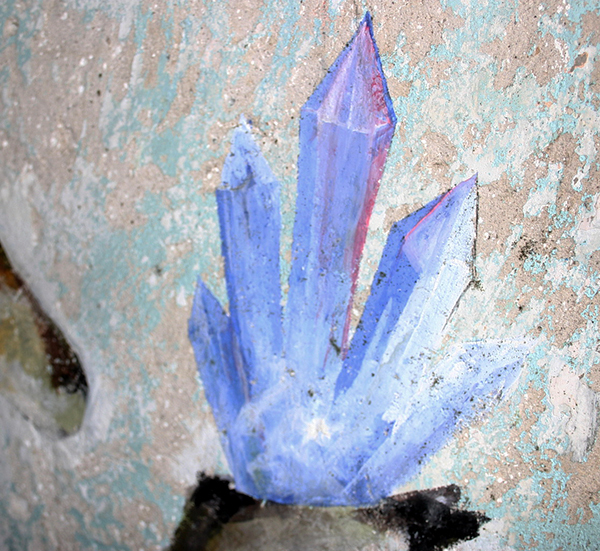 The miners told us that the majority of the pockets are empty – the walls are decorated only by epidote and fine crystalline quartz. Only 20% of the cavities actually contain larger crystals. Owing to sparse crystallization most of the crystal clusters are well separated from each other and they often form perfect floaters. 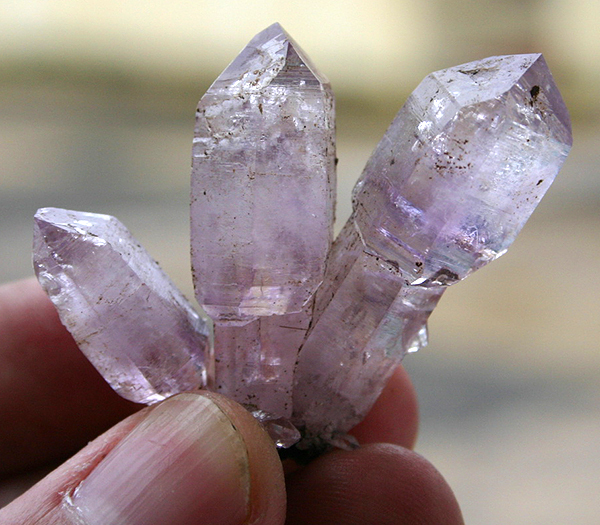 The majority of the crystals are pale purple or colorless. Vesicular andesite from La Cascada. The small cavity is lined by a thin layer of chalced­ony that serves as the base for the growth of quartz. White rounded crystals are calcite. The larger quartzes are of light pink color. 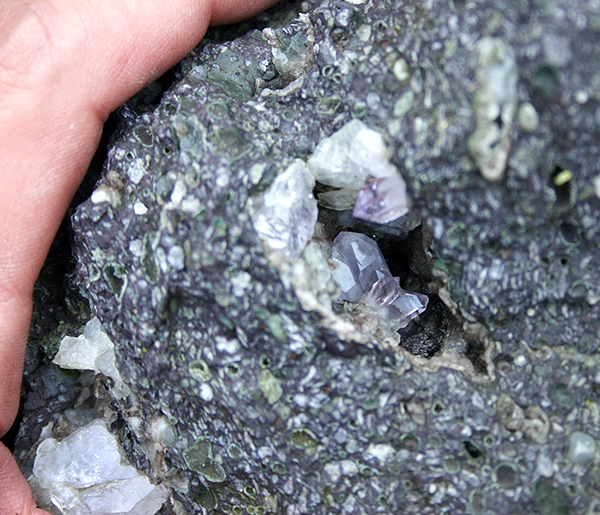 A 2­ cm cavity in vesicular andesite with short prismatic amethyst crystals. Smaller vesi­cles are lined by a thin layer of greenish chlorite. 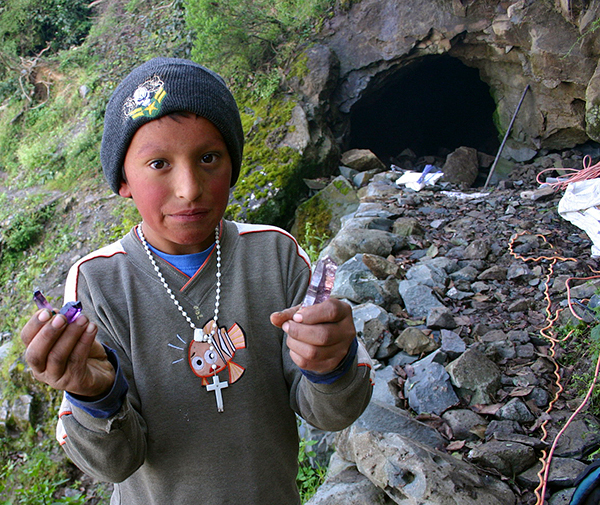 From La Cascada we moved to an active mine, La Loma, renowned for the best deep purple amethysts perched on green epidote matrix. 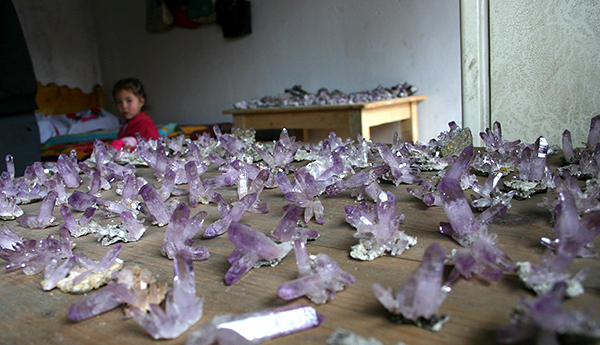 There we met the Trujillo family, which makes their living by mining amethyst. The land here is owned by their relative. Most of the amethyst mines are on the private land and the miners give some of their earnings for the allowance. Mining demands hard work, endurance and lots of luck. But the most expensive is not their time, but the equipment including the expensive diamond drills and weak explosives that can be legally obtained. 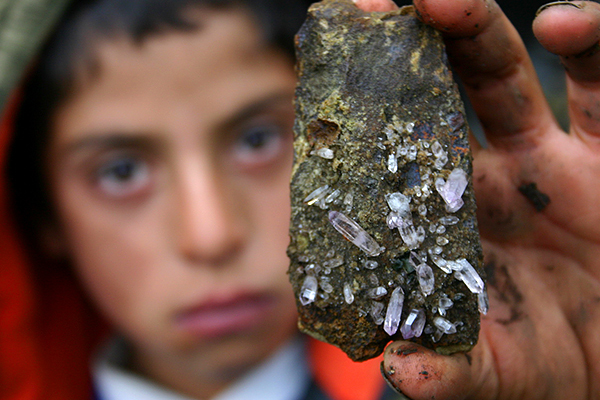 The whole family is involved with mining the amethyst and the earnings are sparse. 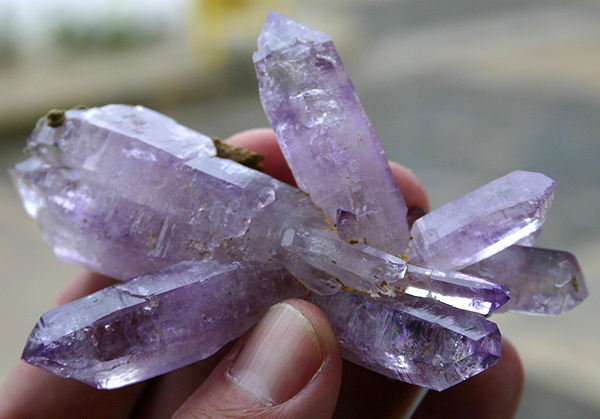 Here one starts to grow a respect those amethyst crystals on a whole different level. One of the amethyst workings at La Loma. A 10­ years old Antonio Trujillo showing his best finds of the day. When their parents are searching for new pockets, kids are scrutinizing the dumps and tunnels for possible slip­pers. All crystals are sold; the points (puntas) in bags for a fairly low price. Trujillo family working at the amethyst locality La Loma. Inside one of the tunnels at La Loma. The host rock is compact and hard andesite. A bottom of an emptied amethyst pocket covered by tiny crystals of epidote and quartz. The black patches are Fe­Mn hydroxy­oxides that are commonly covering the crystals. 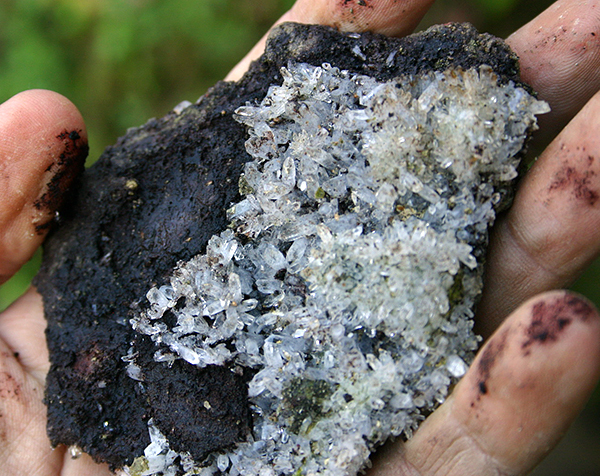 A specimen with tiny clear quartz crystals from one of the open pockets at La Loma. Around the mines there are numerous pits where the locals have tried their luck, even on the grasslands. But our guide Sergio told me that here the specimens are not of good quality due to their exposure to frost during winter. On the way up he gave me the best lecture on the local terminology. 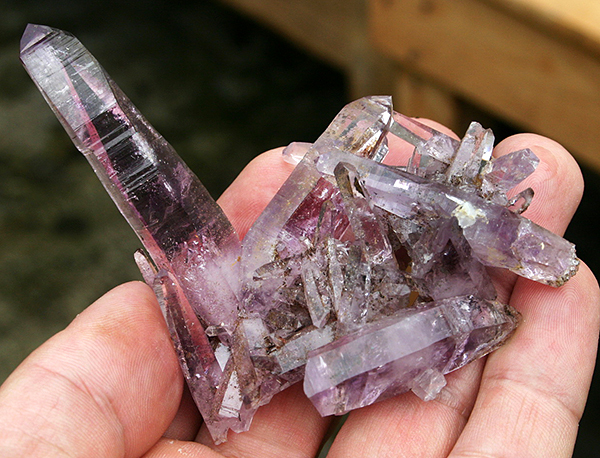 He explained that the pockets are found everywhere, but only few contain quarzo mo­rado (amethyst). On close inspection of the rock walls he soon showed a small cavity that is a good sign for possible amethyst finds. He told that the local miners call these cavities – chollas. They also have names for different types of amethyst clusters – the specimens with amethyst crystals on matrix are called – coronas (crowns) and the floaters – gallos (roosters). As there are no quartz veins, as speculated in older articles, the miners learned through experience how to recognize the vicinity of a crystal pocket. Sergio explained that the rock close to the pockets is soft (leached out?) and has a pale blue color – piedra azul. Just before a pocket appears thin vertical lines filled with greenish to bluish minerals (chlorite, chalcedony?) are encountered. These thin lines are called – realis (signs) and are probably formed as a result of plastic deformation of the rock under lithostatic pressure acting on the cavity. Only the larger cavities have those signs. This may also be the reason why most of the crystal clusters are detached from walls and are found healed on the bottom of the cavity. Their interior is covered by black clayey oxides. An open pit in weathered vesicular andesite above the La Loma locality. 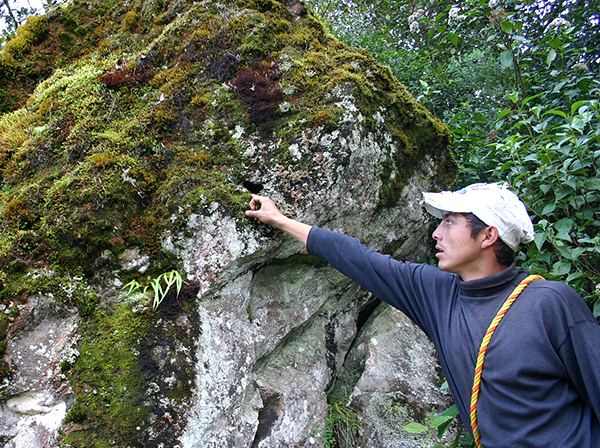 Sergio pointing to a small moss­coated cavity in andesite rock above the La Loma local­ity. These open cavities serve as best signs during prospecting for new localities. 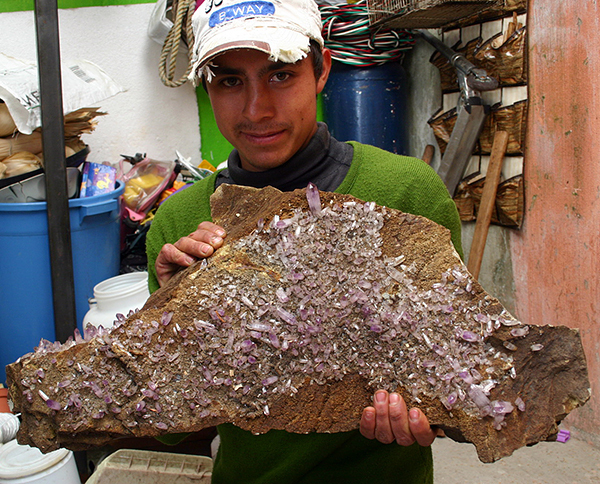 Sergio at home showing his best find of the week – an andesite plate covered by 1­2 cm deep purple amethyst crystals. 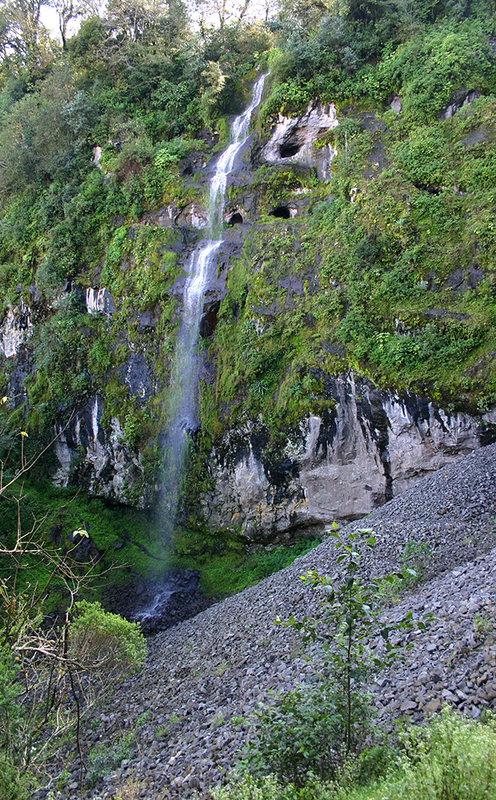 The specimen comes from the La Cascada mine. A trail down to Torrecellas. 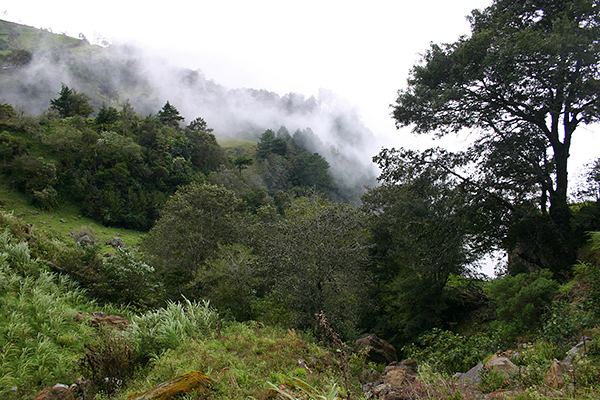 Typical vegetation for the area in the mountainous area of Sierra Madre that can be seen along the north slopes of Piedra Parada. 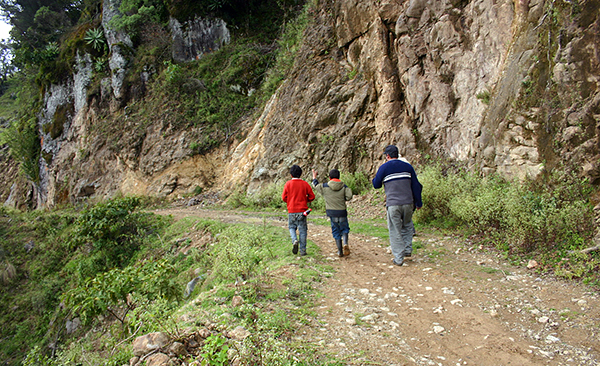 Mason Julio of Las Vigas and Raul`s kids on the way to the Torrecellas amethyst mine. 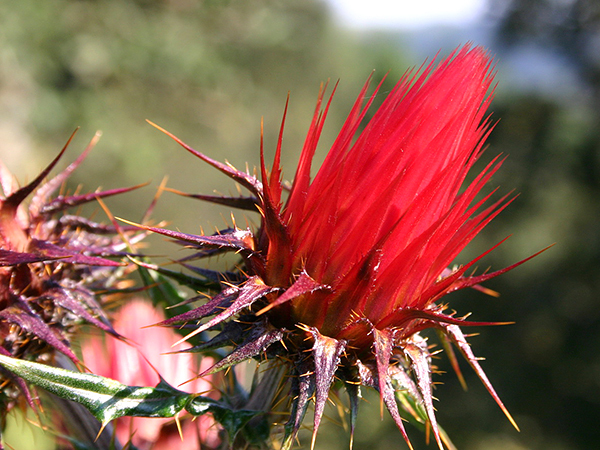 The vegetation in this area is marvelous and one can enjoy every step along the path. 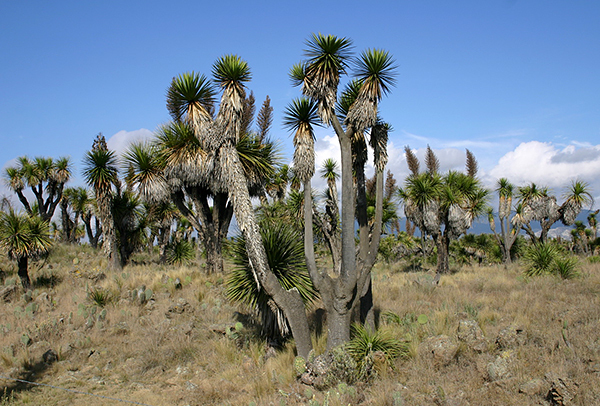 The trees are richly covered by cohabitant agave and lichens, witness to the clean environment and a high level of humidity. 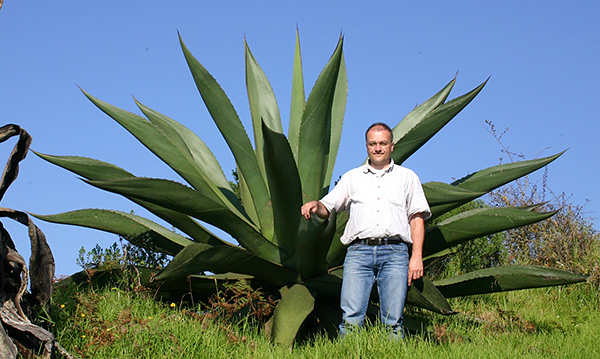 The most fascinating is the diversity of agave plants, among which the most magnificent are up to 3 meters tall. These are maguey (lat. 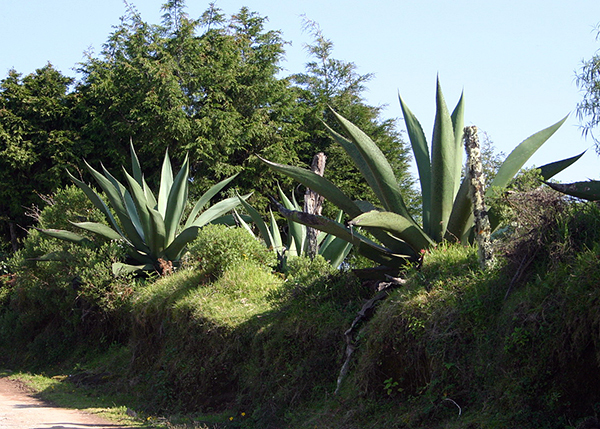 Agave americana), the core of which is used to produce the alcoholic beverage pulque, which according to the shaman lady from El Artesano returns youth and vigor. She said that if you drink beer you can expect to live 60‐70 years, but if you are on pulque, then your life expectation is over 90‐100 years. The main evil is in carbon dioxide, she said, which triggers all systematic diseases of a modern man due to a chronic loss of calcium. A profound explanation that gives you a lot to think about. Truly impressive plants indeed. Along the path Julio brought our attention to delicious orange fruits of paddle cacti (lat. Opuntia littoralis) that grew down the slope to Torrecellas. Patches of snow‐white alcatraz lilies (lat. Zantedeschia aethiopica) added to the scenery. Aleksander with maguey (lat. Agave americana). 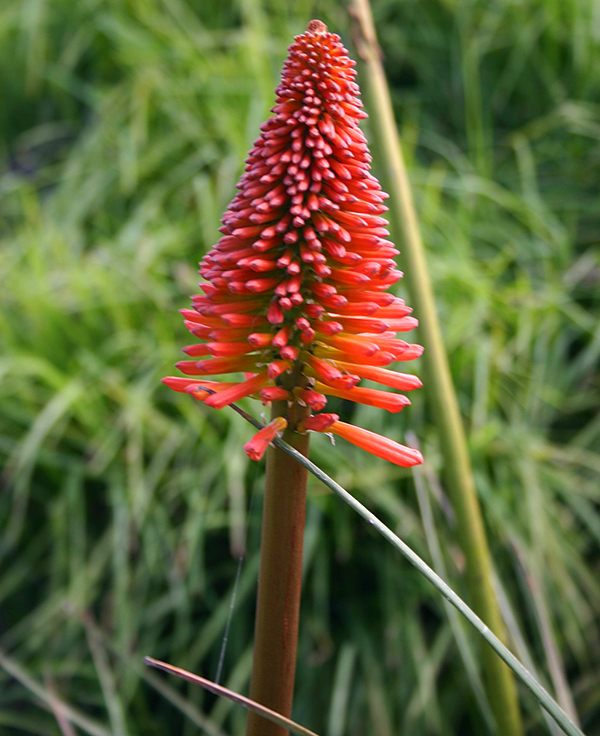 Alcatraz lilies (lat. 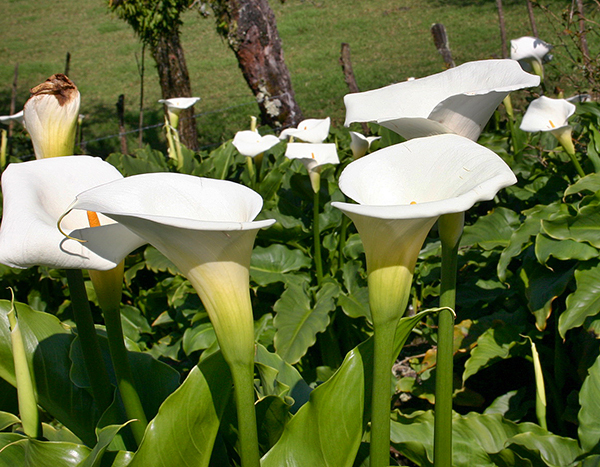 Zantedeschia aethiopica). The mining area is best reached following a horse trail to the north‐east starting from the public school at the western end of the village. After a descent of about 200 m we reached the amethyst mines of Torrecellas. 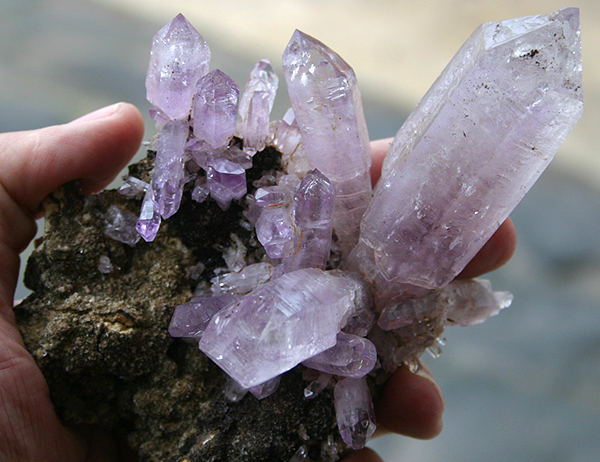 The locality is known for high quality clear amethyst and combinations with white leafy barite. 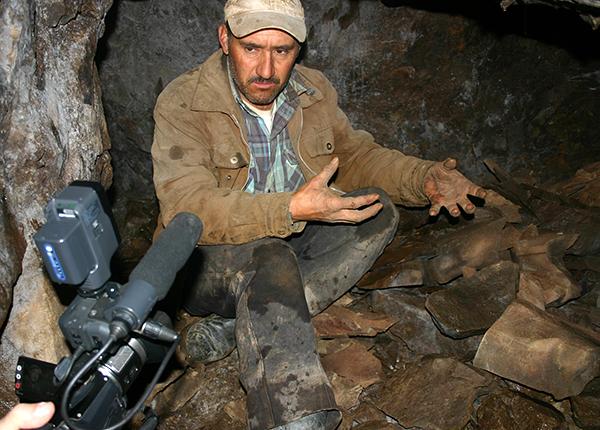 There we met Raul who was just preparing for blasting in one of the tunnels. He told us that he used to excavate a 15 m long tunnel in just 20 days. But he works every day from dawn to the night. Two weeks ago he found two chollas that were almost empty. One of them looked promising. It measured more than one meter, but it contained only a handful of crystals. In this mining site there are around 17 tunnels of different lengths. Some are over 100 meters long. Two years ago he hit into the largest pocket that he ever saw. It measured more than 3 meters in length and was packed with crystals of best quality. The crystals usually lie as floaters on the pocket floor. You just have to pick them out. As chollas are enclosed in massive andesite the crystals are commonly dry and clean, and sometimes covered by a thin layer of black dust. 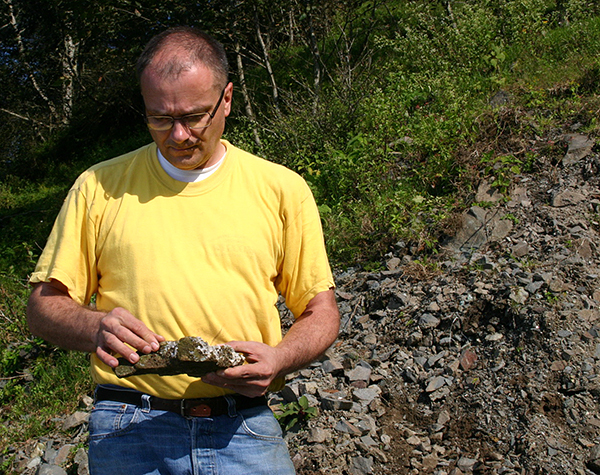 In this pocket he found over 500 amethyst specimens and 100 kg of crystal points. He could not finish it in one day, and when the word got around about his find, he soon had plenty of villagers who came to `help` him. Through the years the miners learned that only undamaged specimens reach the best prices. They invented intelligible way to prevent specimens from damage during transportation. The crystals are packed into plastic or wooden boxes between the layers of sawdust, which can be found in abundance in the village, so that even the most fragile specimens never get a chance to either touch each other or get crumbled by compression, as this is the case if they would be wrapped in paper. He finished work in his mine for the day. On the way up he pointed to the towers after which the locality got its name and told with sparks in his eyes that in that direction there should be further promising localities, but not many people searched there. 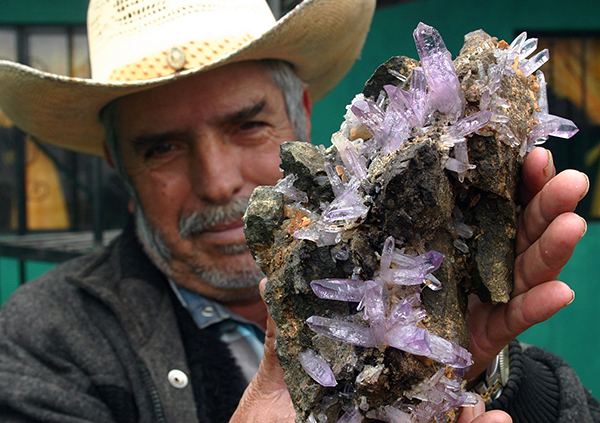 Ten years ago he found on the place called Los Volcanes, up to 20 cm long colorless quartz crystals with deep purple scepters. 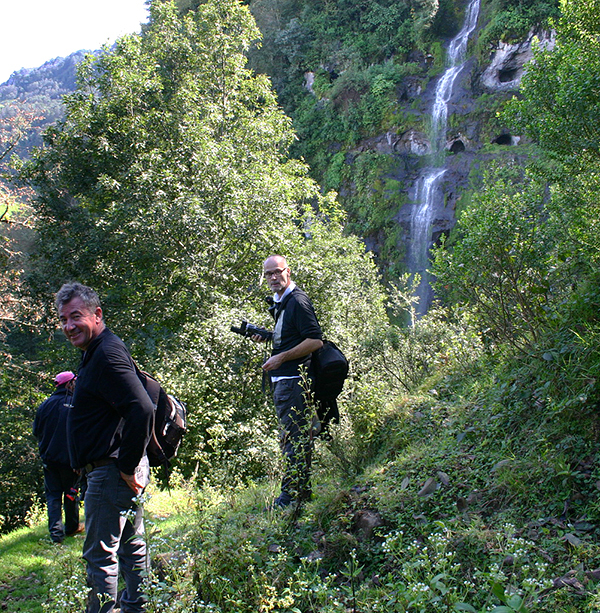 Raul Ortega explaining the work in the amethyst mines at the Torrecellas locality. This is no easy job, and there is no guaranty that the pocket you find will contain any crystals at all. But when you do, the view of the crystals is priceless, and all the work is paid off. Raul`s son showing his best find of the day while searching through the rubble. 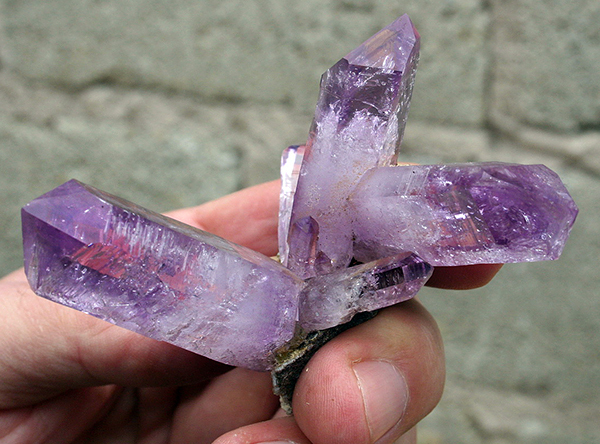 A rare twin of amethyst from Torrecellas. Rain came to town. 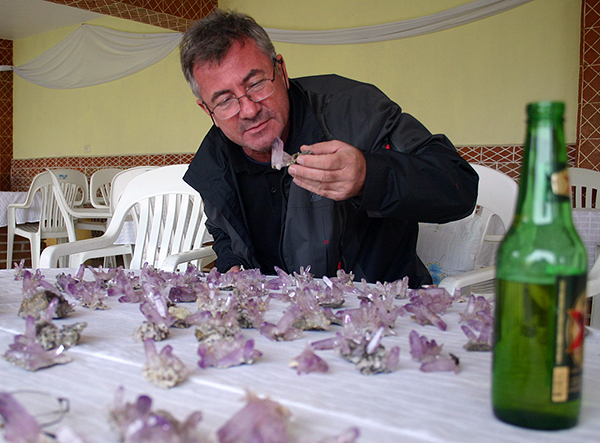 We had an appointment with Jose Ortega and his son in law in Las Vigas to see a batch of really good amethyst. They were at the meeting point exactly at the time when we agreed, showing a high level of respect. The specimens were from a recent find at El Bordo. 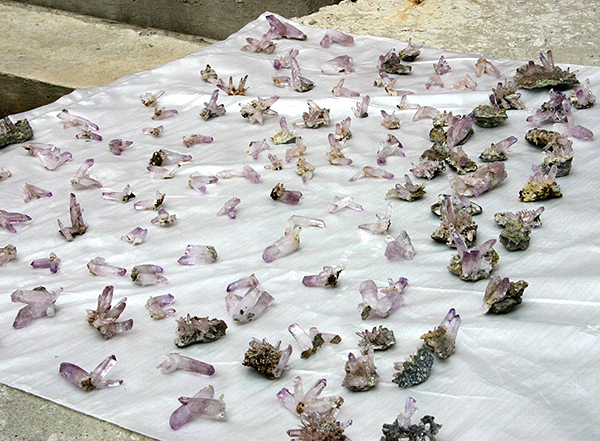 High quality amethyst specimens and floaters with respectful sizes. 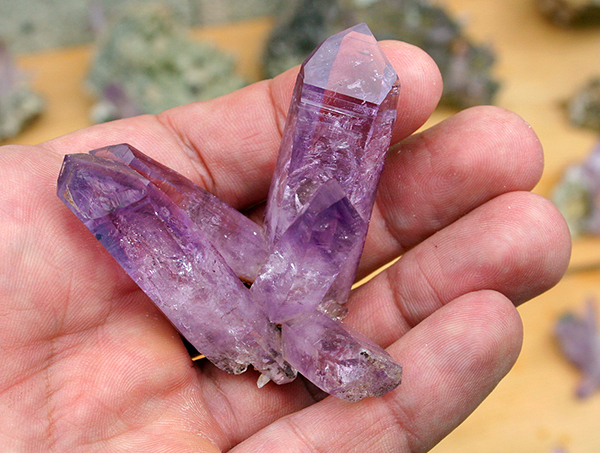 The crystals were of deep purple color and showed absolutely no damage. Of course, we liked the lot and took it with us. This summed up our amethyst expedition to Las Vigas. Table loaded with the precious El Bordo lot. Close up of the table loaded with the precious El Bordo lot. 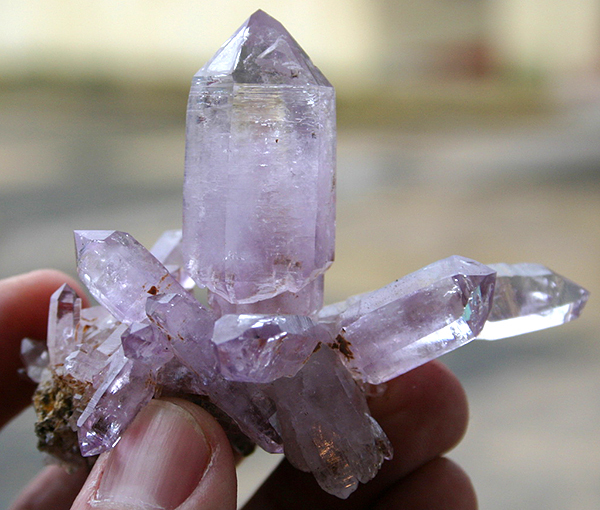 Amethyst specimen from the currently most productive mining area of El Bordo. With the poor knowledge of the specifics it is hard to distinguish from which locality is some specimen. Every pocket is different and can contain some surprise. The larger crystal measures 9 cm. Spectacular amethyst cluster from the find. 8 x 7 cm amethyst specimen from El Bordo. 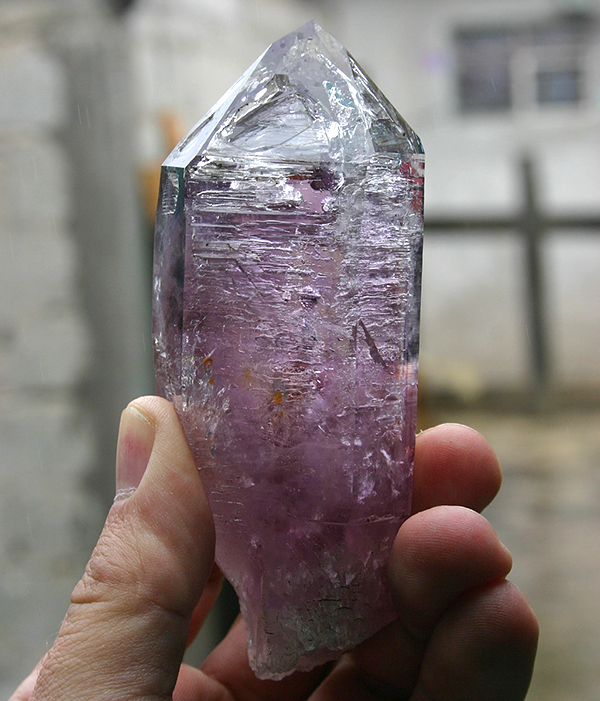 A huge amethyst point measuring 12 cm from the recent find at El Bordo. Many larger crystals contain fluid inclusions and display skeletal window growth. The points (puntas) are not very highly valued by the local dealers. Miran enjoying the freshly acquired amethyst specimens ... and beer. Miran can`t stop enjoying himself. And pollo. From amethyst localities we decided to go for some relax to the coast. 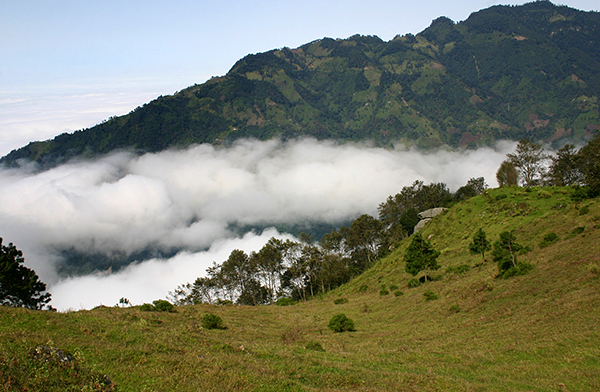 Why not enjoying few days at lower altitudes? The beach is not at all that far ... 1 hour drive or so? 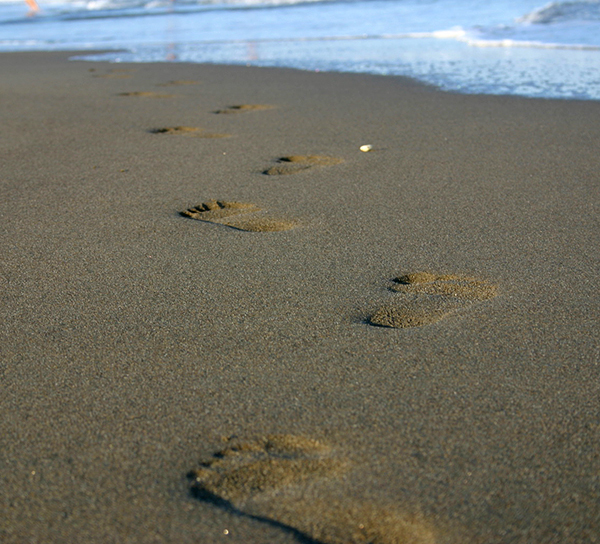 Bare foot sand walking ... something`s wrong here? Or – sand blasting. 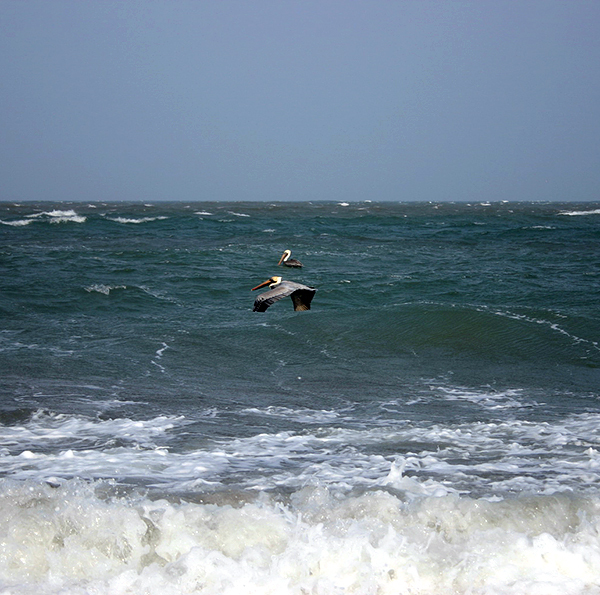 Wind speed of ~120 km/hour! Hi guys, seen any crocks? ... and will remember the friends. We thank Mark Kielbasso from Tucson (USA) and Tomasz Praszkier from Warsaw (PL) for the valuable information and contacts in Las Vigas. Thanks for this great report ! Interesting and detailed information, well presented and with nice photos. Another great article that makes me salivate! I always look forward to your reports. Thanks for doing this. Thanks for comments, we are happy that you enjoyed it! I`d love to tag along on one of your trips!